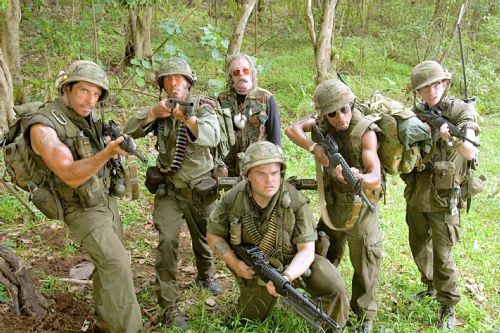 Tropic Thunder is one of those movies you go into desperately wishing for it to be good because its cast and premise could actually make for a hilarious movie, but deep inside you have the sinking feeling that it’s going to fall flat on its face and just be series of fart jokes and racially insensitive comments. Most of the time one comes out of these films with their cynicism reaffirmed, but sometimes wishes do come true. Such is the case for Tropic Thunder. The story of a group of high paid actors making a Vietnam era film in the jungle who then get caught up in an actual fight for their lives, despite not knowing it, isn’t anything new as the Three Amigos already nailed it long ago. This doesn’t mean it isn’t constantly hilarious throughout though, despite being insanely inappropriate for a large chunk of its running time. The five actors, who all represent different Hollywood stereotypes - as almost every character in the film does, find themselves trekking through the jungle after the films director snaps and decides to shoo the entire thing indy style, dipping further and further into insanity and hilarity. The realism is so real. Ben Stiller, as action guy Tugg Speedman, and Jack Black, as comedic fart actor and drug addict Jeff Portnoy, both do admirable jobs of playing characters they’ve played many times before but still making them some what fresh. However, the real spotlight falls on Robert Downey Jr.’s hilarious, academy award winning Australian actor Kirk Lazarus who has gone through a skin treatment program to play a black character. Downey is continuously laugh-out-loud funny as Lazarus and so over the top that any racial insensitivity seems to fly out the window when you’re watching him. One of the funniest moments in the movie comes from simply watching his facial expressions for a few seconds. It may be one of the many cameo roles that steals the show though, as Tom Cruise turns in a performance so funny that it almost makes you want to forgive him for the past two years of craziness. It’s not the over the top aspects of the film that make it great though, it’s the satirical aspects of how Hollywood works that really make this movie. These range from a discussion on how to win an Oscar by playing a retarded person (something the film has got into trouble for) to an energy drink called Booty Sweat being marketed by the rapper who was cast in the film, Alpa Chino (Brandon Jackson). The satire elevates the film above the stupid jokes to a level of intelligent comedy that many summer films of this ilk completely lack. I cried. I'm not ashamed to admit it. Bawled my damn eyes out. The film is especially entertaining for film buffs that can recognize how perfectly the direction of the movie by Ben Stiller parodies Vietnam War films. Almost every scene has a directorial joke behind it that makes fun of the heavy handed Vietnam film directors of the 70’s and 80’s. It’s one of those things that if you know movies you will enjoy the film all the more but it’s plenty funny without it. Sadly, in the end Tropic Thunder seems to miss its own point, landing firmly on the side of stupid comedy with no emotional payoff at all. Of course anyone wanting emotional payoff would probably have gone to a completely different film. Who wants character development when you can have Jack Black gnawing on a bat because he thinks it’s covered in coke? Five out Five. I liked it. Doesn't mean you have to...actually, yes, yes it does. Plus a teaser for Friday's Monday review. It's got light sabers and will make you wish a certain series of movies never existed. I mean ever. Even the good ones.